I have always known and accepted the fact that I cry in every single movie, ever. But it was a huge shock even to me last night to discover that even the Super Bowl could bring me to tears. For starters, I was sooo excited for the Saints to finally win a Super Bowl. That merited one pseudo, side-of-the-eye tear. No big deal. OOjaboo! 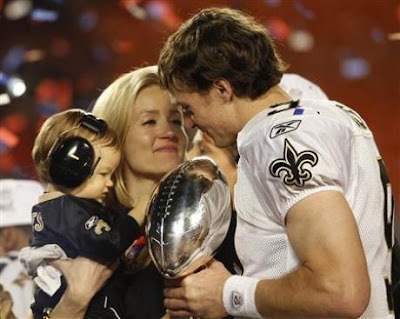 That little boy is so damn cute and Drew Brees is so proud and emotional. That moment required a full fledged tissue. Go Saints! Go America!